Enjoy the pleasures of a day at sea without ever leaving your home or office with this finely-crafted and detailed Catalina sloop yacht model. 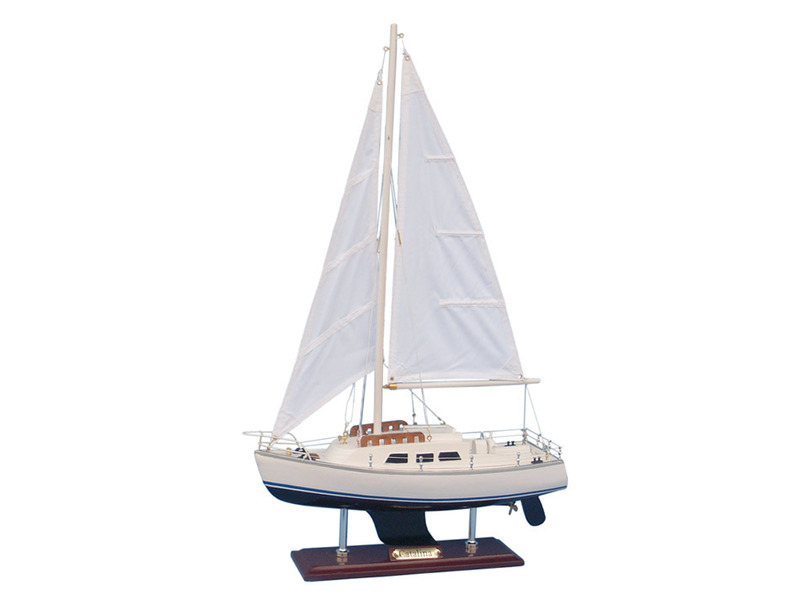 Accurately designed and crafted to the specifications of real Catalina pleasure yacht models, this fine replica is an ideal escape for a short fantasy cruise during your day, or a wonderful model sailboat addition to the nautical décor theme of any room or office. Catalina Yachts is one of the largest boat manufacturers in the world, with over 60,000 boats manufactured to date. Though Catalina produces boats from as small as eight feet under their Capri nameplate, the company is best known for its production of mid sized cruisers. The ocean going Catalina 50 was their largest design, but has been discontinued and replaced by the 470. Most original models are still in production albeit with substantial modifications, and there are examples of every Catalina model still in use. Gerry Douglas became Chief Engineer and V.P in 1982 and has designed all the boats in the line since then, starting with the Catalina 36. 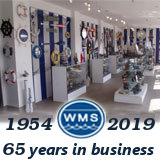 Wesco Marine is currently held as a separate entity which provides rigging hardware to Catalina Yachts. In 1998 Gerry Douglas and Sharon Day were made partners in this privately owned company; however, Frank Butler remains active to this day. Catalina has two production facilities; one in Largo Florida, the former home of Morgan Yachts (merged with Catalina), and one in Woodland Hills California, where the company is headquartered. Catalina's classic approach of putting the deck on before the components go in is still followed in the California factory, but in Florida the components go in before the deck goes on. In some cases large assemblies such as the head (bathroom) are pre-assembled and craned into the hull. This may be a vestige of the Morgan production culture. However in any case the philosophy remains that every bolt on part must fit through the hatches for maintenance—even the engine. Most of the older designs are produced in California and the majority of the more recent offerings are produced in Florida. As a side effect, the C42 (42 foot) is less expensive in California than the smaller C400 (40 foot) due to shipping costs. With a few exceptions, Catalina has focused on long term models making small changes from year to year; this has encouraged the development of owners' associations which promote "one design" racing and other forms of camaraderie. In return Catalina makes sacrifices in the ability to compete with cutting edge styles and trends. All of the larger cruising class boats, 27 feet and larger, have fixed keels with lead ballast. A notable feature of most Catalina boats is their large cabin interiors and storage they provide.